This nine-day adventure leads you through valleys surrounded by mountain lakes and snow-capped peaks, ancient pre-Inca structures, and dramatic views of waterfalls above the clouds. Begin in Ecuador’s capital and second largest city, Quito, where the intimate and luxurious boutique amenities of Casa Gangotena provide endless comfort as you acclimate to the area’s higher elevation. Your Ecuador horseback riding adventure through the Ecuadorian Andes commences in Otavalo at a 17th century hacienda and working farm that serves as a spectacular base from which to explore the wonders of the region. The next five days are dedicated to uncovering Ecuador’s culture in the highlands from the back of a robust, noble, and smooth Andean Zuleteño horse, a unique mixture of Spanish–Andalusian, English, and Quarter horses with a perfect disposition for trail riding and any skill level. Each day’s ride has a particular beauty and charm, and is accompanied by sumptuous three-course picnic lunches in the countryside. Your accommodations at Hacienda Zuleta feature an in-room fireplace, wireless internet access, satellite television and communal living rooms. Feel free to join in the numerous daily activities around the farm. Foals are born every month in the breeding barn, and horsemen will appreciate the help in training the young colts and fillies or refining canter aids in the ring. Go visit the different herds in the fields, or encourage the playful foals to canter alongside you. While not riding, you are welcome to take horse-drawn carriage rides and mountain biking trips into the mountains, or hike through the pastures and forests of the undulating valley. 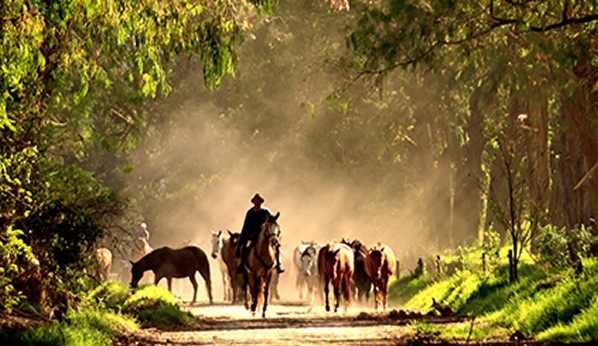 At the end of this exhilarating sojourn, say farewell to your horse and return to the Casa Gangotena which exudes the beauty of a bygone era and is an intimate and luxurious base from which to explore Ecuador’s stunning capital. Ecuadorian flavors from all over the country are celebrated at the contemporary restaurant. Hearty soups are served in traditional clay terrines and local fish, meats, and produce are the stars of this culinary show. Sample irresistible Ecuadorian chocolates, coffees, and teas at all hours, particularly during the high tea served daily in the glassed-in patio. A wood-paneled library delves into the history of the hotel as a home and of Quito itself, but the best way to see the city is from the third-floor terrace. Guests can easily discover the city at ground level too, as Old Town, the Presidential Palace, and many of Quito’s famous sites are within mere minutes from the gracious hotel.